". . . . AND THROUGH IT ALL THE SEED WOULD SPROUT AND GROW, HE KNOWS NOT HOW." 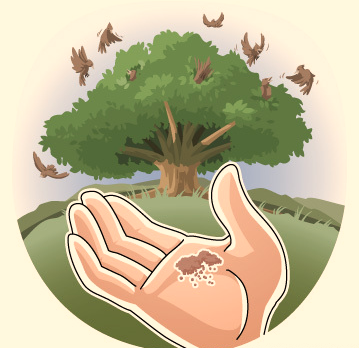 Our Scripture readings this Sunday focus our attention on the small seed (or small shoot) that, with the grace of God, will grow into a mighty tree with room for all the birds of the sky (people of all nations). In our first reading (Ezekiel 17:22-24), we hear the beautiful allegory representing God's restoration of Israel. So great will this majestic cedar be that "birds of every kind shall dwell beneath it." In the Christological sense, the small branch represents the Christ, plucked from the majestic tree of David. In our Gospel reading (Mark 4:26-34), Jesus relates two parables about seeds that teach us that God is the source of all growth and that even the smallest of beginnings, nourished by God, can change the world for good. It is God who commands the seed to rise, though the farmer is unaware. In our Epistle reading (2 Corinthians 5:6-10), St. Paul teaches us that our life here on earth is temporary. Our bodies are a "home away from home", until we rest in the Lord. At death, we will receive the merits of our life here on earth. We sometimes have two roles. At times, we are the fertile ground in which God plants his seed and with God's grace, produces much fruit. At other times, we are the sowers of the seeds God gives us to plant. We, in our aspirations of grandeur, sometimes look for the largest of seeds to plant, when in reality, it is often the smallest of seeds, the smallest of deeds, that bear the most fruit. It is not for us to know what becomes of the seed. "Of its own accord, the land yields fruit". We, grateful for the opportunity to sow the seeds, must trust in God's wisdom. God often works through the small, the weak and the forgotten. Often, it is the smallest of deeds that, with the prompting of God, will grow into the mightiest of trees. Think of St. Therese of Calcutta at her beginnings, one small woman among the poorest of the poor, simply ministering to one person at a time. And so many others, who only by the grace of God, changed the world. It is not for us to know the good that we do.